Surfing is all about fearlessly challenging the wild wind and waves and so inevitably carries with it unavoidable risks, but success on the water nevertheless depends on the practise of safe surfing. Surfing is essentially the sport of catching and riding waves on a light, buoyant, strong and manoeuvrable hydrodynamic board. Although, like most watersports, surfing carries with it the inherent danger of drowning, here it is particularly pronounced because the very nature of the sport is of the lone surfer challenging the wild elements with only a board as protection. The board itself is a useful buoyancy aid, but its only other safety feature is the leash, which is attached to the ankle or knee. This is only a convenient feature to keep the board under control and connected to the surfer, and not a safeguard to prevent drowning. Instead a safe surfer must rely on their own wits, heed the advice of more experienced riders and not push themselves beyond their own limitations. The key rule is that if a surfer cannot handle the water condition without a board then they should not go in at all. Surfing can be a demanding sport and those eager to take part should be relatively fit and able to swim at least 50 metres in open water. 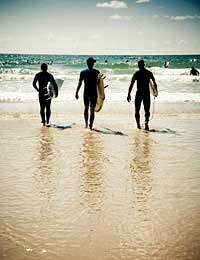 A safe surfer should also begin by taking an introductory course with a British Surfing Association (BSA) approved surf school in order to learn the basic techniques of paddling, catching, riding, turning and leaving a wave. Two essential equipment checks that should be carried out before any surfing adventure are firstly to make sure the top of the board is waxed to provide a good grip for the feet, and secondly to check the leash is in good condition and does not show any signs of fraying or general wear and tear. The wearing of a wetsuit whilst surfing is standard practise in the UK because the temperature of the waters rarely strays above very cold. If a surfer stays warm in the water they will stay comfortable and be able to perform better. To keep wetsuits in a good and safe condition they should be peeled off inside out without any overstretching and then rinsed thoroughly in fresh water and then hung up to dry away from direct sunlight. When storing the wetsuit it is best to roll it up rather than fold it, as it will crease easily. It is important to choose the right location not only for the best waves but also for the safest surfing. When choosing a location surfers should take note of any beach restrictions. On busy lifeguarded beaches, for instance, surfers should look out for the black and white chequered flags that indicate the areas where surfers can hang. These are erected to avoid boarders crashing into unsuspecting bathers. More remote areas of shoreline can offer more freedom away from the beach crowds but surfing alone in these unsupervised spots can be very dangerous, and so it is essential to take at least one surfing buddy along for the ride. To prevent injury and cramp in the water, surfers should spend a few minutes warming up before entering the sea. This is to raise the heart rate and warm up the muscles. Other sports such as cycling, running and particularly swimming are great ways to help improve stamina out on the water and tone up those paddling muscles. When paddling out into the water surfers should give ample room for surfers already riding the waves as well as other water users. For example if a surfer happens to ride a wave towards someone paddling in, then it is polite practice for the latter to head towards the white water, out of their path, even if it means getting tumbled by the wave. Proper surfing demands the ability to keep control of the board at all times and not let the board control them. Beginners can achieve this level by not heading out too far at first and perfect their technique on the smaller inside waves. Following alarming recent statistics whereby nearly half of all incidents dealt with by Royal National Lifeboat Institution (RNLI) lifeguards involved board related activities, the RNLI have got together with the BSA to raise awareness of surf equipment hire safety to help reduce the level of surf-related incidents in the UK. The discovery that a significant number of these incidents involved novice surfers using hired equipment has led to investigations showing that there are potentially thousands of surf outlets hiring out dangerous equipment. Anybody who is hiring surfing equipment should therefore first check that the hire service is BSA and RNLI accredited.